The great expectations of readers, when picking up a mystery novel, is the promise of a story that rivets our attentions with an intriguing murder and engaging characters, both sleuth and suspects. Consider this, “An envelope is discovered in a cemetery addressed to Mlle Véronique Champourcieux. The letter is kindly posted. Later, that same Mlle Véronique is found dead—impaled by a rusty bayonet. 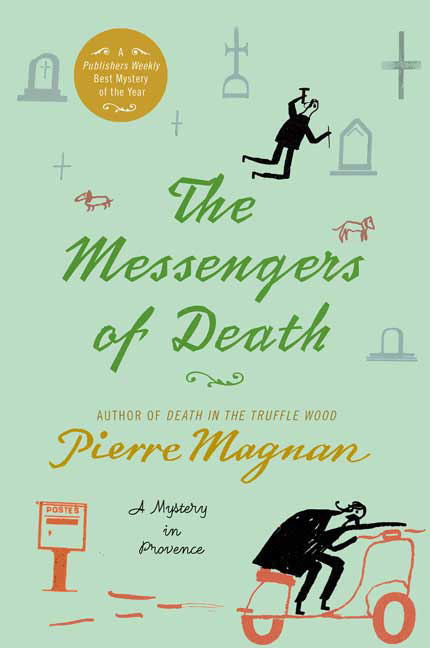 Commissaire Laviolette is coaxed out of retirement to solve ‘one of the most bizarre crimes imaginable.’ ” This is the intriguing synopsis of The Messengers of Death by Pierre Magnan, a French mystery set in the popular Provence region. An interesting premise that becomes mired in discourse. The mystery here is an interesting one. The victim receives a letter, warning, “The measure you give will be the measure you get.” Mlle Véronique is on her guard. She attempts to protect herself by having a tiny mother-of-pearl handled revolver ready at hand. She is alone. The mistral winds are blowing, and her house with its familiar creaks is invaded by the steps of an intruder. “He hasn’t a hope!” she says. She knows the intruder is searching for something, something she has. In the end, the intruder confronts her. The rusty bayonet, picked up because it was handy, is used to kill this unfortunate woman, who obstinately refused to divulge what her killer sought. Some pages later, another woman—Ambroisine, a relative of Véronique—receives a similar letter. She, too, will be on guard to defend that which the killer seeks. Enter Commissaire Laviolette. “He had aged. He had inherited some money. He had bought a house where he could peacefully mull over regrets at things done and left undone.” “At sixty he still had great difficulty in sorting out true from false, separating good from evil, choosing between strong and weak … discerning the superiority of one opinion over another … He called this wavering indecision in his character—which spared him suffering—being a contemplative. Though not having been witness to the murder, Laviolette preternaturally seems to understand the sequence of what must have occurred leading to the woman’s death. Yet, he decides initially, “I’ll follow the case in the newspapers.” As if he would not be stirred to investigate. “Slow but surely and day by day, Véronique’s ghost came between him” and his routine. The circumstances of the case being so unusual and captivating that Laviolette is invested in discovery the who and the why. Indeed, the chapters focused on the murder mystery captivate, especially the deliberate, building suspense prior to each murder. We readers witness the imminent doom coming to each victim in turn. Where the novel fails in delivering those “great expectations” is in the numerous characters of varying degrees of importance, each with their own detailed backstory, given attention alongside the descriptions of the region, its haunting Mistral winds, and the history that pervades land and people. Take for instance, Émile Pencenat. In chapter one, Émile is busy digging his own grave—literally. He’s determined not to be buried with his wife in the family crypt. He discovers the first addressed envelopes containing the fateful letters. A former postman, Émile feels duty bound to post them. In most respects, Émile would be considered a minor character at best. One who serves primarily as a device to deliver the mysterious letters and later to arouse suspicions as a potential suspect to authorities. Yet, in the very same chapter in which he’s introduced, we learn about his reasons for digging his burial plot and about his wife and her mistress. In the following chapter, we follow him to his weekly card game, where we are introduced to his fellow players. They in turn are giving their own backstory and eccentricities. In fact, a psychiatrist moving to the area would rake in a fortune if he could convince the locales to trust him and discuss their many foibles, for every last one of them has them in abundance! The Messengers of Death is mired in its region and history. Laviolette discovers an elderly doctor living in a nursing home who possess the secret to why the murders are happening and who the killer is. After the second murder, Laviolette asks a nurse, “I need to find a man who is from these parts, and not too uncouth … Someone well past eighty who still has all his wits about him.” That man is Dr. Pardigon. He’ll recount the history of region and in particular the genealogy of the Melliflores family, who clung to traditional mores wherein the eldest son inherits all and the younger sons are left destitute. The doctor considered himself “a winner.” “Just look at all those I’ve passed on the way.” Meaning who he’s outlived! He takes his sweet time recounting his story. Insisting he’ll not be hurried. Much like this mystery story. Initial expectations must be amended. This is not so much a traditional murder mystery as it is a Dickensian style novel. Many of the characters, with all their quirks, may very well remind readers of the colorful eccentrics in the pages of Dickens’ novels. With that mindset, this novel is quite good and on par with such stories. For those expecting a quick, riveting mystery, their disappointment may prompt them to stop well before the finish. For those willing to take the time and persevere, they may enjoy the gems of linguistic usage and philosopical insight, albeit in translated form. The Messengers of Death is the second mystery featuring Commissaire Laviolette to be translated into English. The first is Death in the Truffle Wood. Author Pierre Magnan was a renowned crime writer in his native France. He passed away in April 2012. For more about the author’s life, click here.